SHORT & SWEET: Spirit-level and Straws! Brides Mum, Liz rang me today and thanked me for the cake. She said it was "more than good ... it was magnificient. The ganache was especially wicked!" Emma had purchased the cake stand and her grandmother had made the silk flowers (so beautiful) She couldn't find a suitable ribbon and so found some discounted wine gift bags from a store and cut them to size - it gave her the look she wanted at a fraction of the cost of bought ribbons. 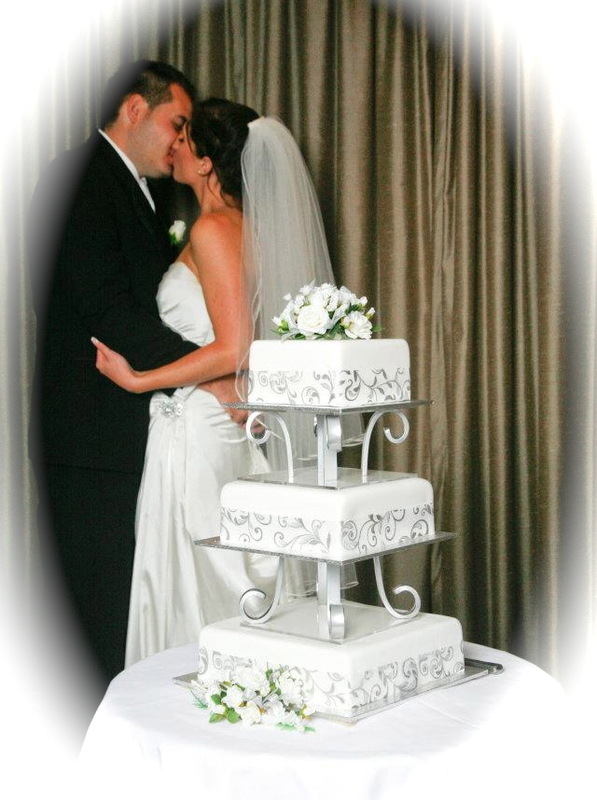 How clever - the pattern looked like it was embossed into the cake.Photo used with permission of the beautiful bride. The 'bottom tier' - Dark Chocolate Jaffa Mud with Bitter Orange ganache filling- and 'mid tier' - White Chocolate Raspberry Swirl Mud sandwiched with Sweet White Choc ganache and Raspberry sauce . The top tier was extremely dry - so dry in fact that it is inedible ........ I trick you it was a dummy cake made from polystyrene! I ganached, levelled and laid the fondant on the cake. No worries! 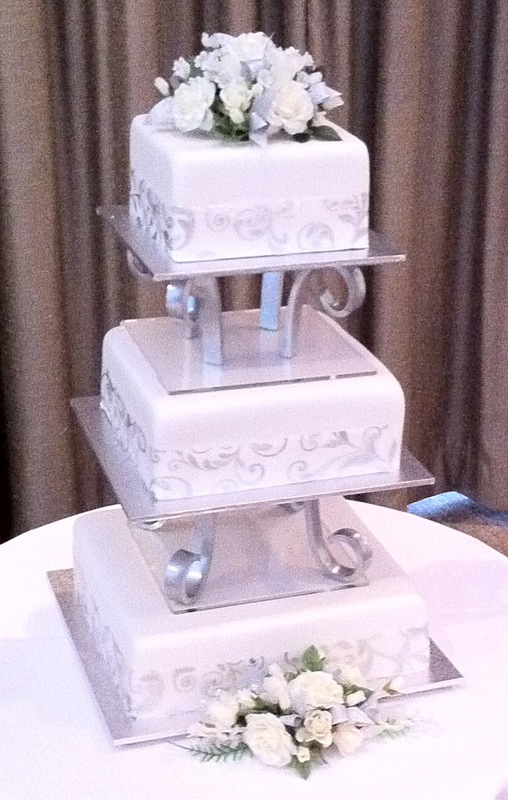 I had to get the cakes absolutely level as I didn't want it to look like the leaning tower of ...... you know where! The spirit level was invaluable in getting the level accurate, I used straws inside the lower level of the cake instead of dowel to strengthen and prevent the cake sinking. Note: A Martha Stewart tip! I went along to the marriage service at St Pat's in Albury and Emma was stunning in a beautiful gown. Definitely giving Kate and Pippa a run for their money! Privilege to be part of this happy event.